At Rich Chicks we don’t add fillers, binders, artificial colors or flavors to our whole muscle chicken slider fillets. What we do add are the highest quality ingredients and truly whole muscle chicken. Our mouth-watering sliders are whole grain breaded and ready to eat, the way it was intended. Rich Chicks, unrivaled quality, Rich in Flavor, Rich in Nutrition. For a quick and flavorful breakfast (or lunch) solution that will wow even your toughest critics, serve up Chicken & Waffles. 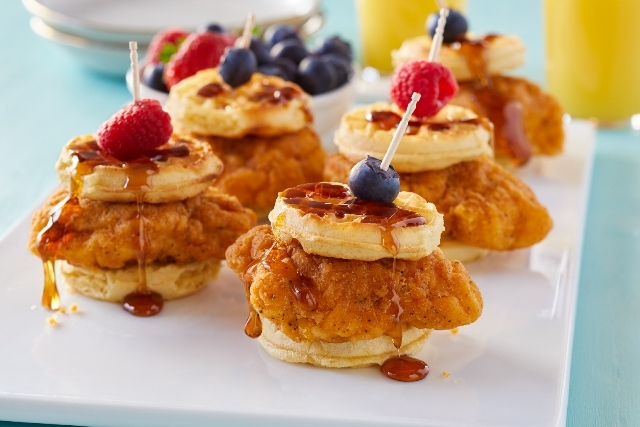 Top lightly toasted waffle mini bites with Rich Chicks Premium Gourmet Whole Grain Breaded Whole Muscle Chicken Sliders. Skewer your favorite fresh berries with a toothpick for the perfect healthy garnish. Drizzle with slightly warmed real maple syrup for a deliciously sweet finish. Warning, excessive smiles may occur. Build, enjoy, repeat. Rich Chicks, it’s what’s for breakfast, or lunch, or dinner, or whenever!